Most children love stuffed animals. I remember, when my daughter was little, she had a stuffed rabbit that brought her an amazing sense of calmness and peace. Along with her baby blanket, the stuffed rabbit is what Nadine and I would turn to when she was upset or couldn’t fall asleep. Don’t raise your hands, but I wonder how many of you had a stuffed animal, or a cuddly doll, when you were a child – Something soft that you cuddled with and that helped you, somehow, to feel a little more secure? I do remember a neighborhood boy who told me he had a stuffed Jesus. I never had heard of such of thing. Since then, I have learned there are several different ones. There’s the Jesus with the beard that needs trimming. There’s the Jesus doll that never stops smiling. There’s the Jesus doll that you can take to bed with you. And then there’s the talking Jesus that recites Bible verses. Now don’t get me wrong, I do understand the best of intentions of both the creation of the dolls and of the parents who bought them for their children. We want our children to understand that Jesus loves us and is present with us to care for us and to comfort us. But it also makes me uncomfortable to reduce Jesus to being seen as only our cuddly friend. Friends are a good thing. I treasure the ones I have and I could certainly use more. However, I need Jesus to be more than my friend. Luckily for me, and for all of us, Jesus Christ is much more than a friend to us. Our text from Colossians this morning brings us a dose of what is called high Christology. In other words, it speaks of the cosmic implications of who Jesus is. Our reading in the book of Colossians describes Jesus as “the image of the invisible God,” and says that “all things have been created through him and for him.” And then adds, “in him all things hold together,” and then, “in him the fullness of God was pleased to dwell.” (1:15-19) This is a grand vision of the Son of God, who is over all and above all and rules everything, who is fully God in all his majesty and might, and whose authority reaches into every aspect of creation. The book of Colossians was written to a small community of Christians who were surrounded by a variety of teachings and beliefs concerning God. Like the world we live in, I suppose, with so many different philosophies and religions and beliefs. It is clear that the author of this letter, said to be the Apostle Paul, is deeply concerned that these Christians were being tempted by these competing beliefs. They wanted to understand their world and their place in it. They wanted to understand the reason for their lives. They saw the brokenness in their world and in their lives, and wanted to make sense of that and wanted to have hope for a better world. The Apostle Paul brings the Colossians and us the news that we do not need to be continually shopping around for a belief system to make sense of the universe and our lives. We sometimes envision God up there or out there somewhere – eternal, perfect, and all powerful. And we know that we exist. We bump our knees on the coffee table and forget where we left our eyeglasses. We are remarkable, but imperfect, creatures. But now we are told, in this Bible reading, that this perfect God, all the way up there, has travelled all the way down here and become one of us in all our grand imperfection. “For in him the fullness of God was pleased to dwell.” (1:19) We’re not talking about a whisper, or a hint, of God to be found in the man Jesus, but the complete fullness of God dwelling in him – 100%. What is eternal has entered into mortality. What is all-powerful has entered into vulnerability. What is beyond suffering has entered into our suffering. Jesus, our Lord, has entered into our humanity, into our daily challenges and frustrations and hardships. We are actual participants, each and every one of us, in this remarkable event of God, entering into our human existence. And so, I want to ask, is there a way of describing this truth that would help us to understand this big, all-encompassing vision of Christ entering our world for the sake of all humanity. The soft, cuddly Jesus doll, while providing an insight into Jesus’ love and care for us, will not take us nearly far enough down the road. We need a something to compare to our Lord Jesus that can demonstrate a love so big, so strong, and so encompassing, that it can embrace all people, and all creation. If we’re going to think about Jesus in doll terms I might suggest a flashback all the way to the seventies and a doll called Stretch Armstrong. 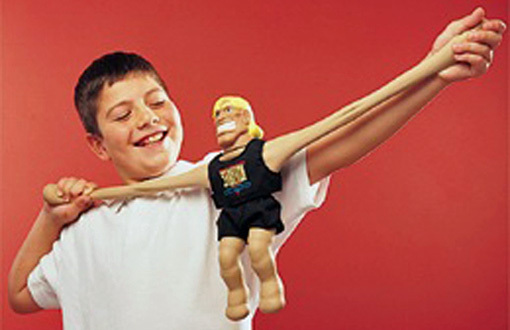 This doll was based upon a super-hero who could stretch his body in vast and remarkable ways. It was constructed out of some rubbery, plastic concoction and boy could that thing be stretched. I never owned one myself but I am old enough to remember it. I knew of other boys who had one, and the biggest goal was to try and pull that thing as far as possible to see if you could get it to break. I never heard of anyone who was able to stretch the thing hard and far enough to accomplish the destructive task. Now that is an image of our Lord Jesus: Stretch Armstrong…reaching from one end of the universe to the other; all the way from divine perfection to human imperfection, all the way from heaven to earth, touching each and every existing element along the way. Through Christ we are deeply connected to God, deeply connected to each other, and deeply connected to all creation. In the end, whatever appears to separate and divide us from each other and the world and our God, is transcended by our Lord Jesus. Sin? Taken care of by Jesus. Death? Taken care of by Jesus. Evil? Taken care of by Jesus. The Devil? Taken care of by Jesus. Read this with me: “And through him God was pleased to reconcile to himself all things, whether on earth or in heaven, by making peace through the blood of the cross.” (1:20) In the cross of Jesus, there is a bond that has been established between God and all of his creation – a bond of divine love in the midst of human hatred, a bond of divine mercy in the midst of human sin, a bond of divine faithfulness in the midst of human unbelief. And no matter how hard we pull away, that bond cannot be broken. There is something vital about this way of understanding Jesus, this high Christology, as we call it. For here, in Jesus, we see how God is not far off, in some other realm, but dwells right within us, and connects all of us to each other and to God. The power of the risen Christ is at work in our world, and in you. You are being drawn to God by the power of the risen Christ; you are being drawn into unity with others by the power of the risen Christ; and you are being made new, by the power of the risen Christ. Whether we can always understand it or see it, we are nevertheless invited to believe it and to open our lives to it, allowing ourselves to be drawn to God by Christ, allowing ourselves to be drawn to the community that bears his name, and allowing ourselves to be drawn to the new life he would have us live.